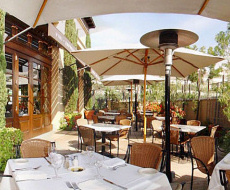 Please join us for the rehearsal dinner at the Il Fornaio restaurant in Manhattan Beach. It will be an excellent opportunity for the extended families on both sides to meet and greet each other. We will also be celebrating a number of birthdays! Jason's best friend Martin, Jason's brother Rod, JoAnn's friend Jill and our friend Laurice will all be sharing their birthdays either on Friday or during our wedding weekend. Step inside Il Fornaio and take a culinary journey through Italy. Early mornings bring rustic, crisp crusted bread hot from the oven accompanied by the scent of fresh brewed espresso. During lunch and dinner hours, pastas and flavorful sauces simmer while meats and vegetables roast over hot coals. Bottles of wine from small, regional wineries are uncorked to complement the dishes, which have been crafted in the custom of Italy's chefs, bakers and homemakers. In the tradition of Italy's trattorias, the sights, sounds and aromas of authentic Italian cuisine are recreated fresh everyday at Il Fornaio Cucina Italiana.